Dubai, one of the 7 Emirates that comprise the United Arab Emirates (UAE), has emerged as an important regional physical gold import, export and redistribution hub, and also as a gold trading centre. The local gold market comprises extensive gold refining, gold wholesalers and distributers, a very large gold retail sector, as well as the emergence of gold trading and brokering operations. Most gold trading in Dubai is still on an over-the-counter (OTC) basis, but there are now 3 gold contracts on the Dubai Gold and Commodities Exchange, a recently launched Spot Gold contract, a recently launched Indian Rupee Gold Futures contract, and a larger Gold Futures contract which was launched in 2005. Dubai Multi Commodities Centre (DMCC) is a Government of Dubai authority established in 2002. The DMCC’s aims are to develop and promote the flow of physical commodity trade through the Emirate of Dubai by harnessing an extensive free trade zone known as the Jumeirah Lakes Towers (JLT) Free Zone. This JLT Free Zone offers member companies business incentives such as zero-percent corporate tax, a large choice of commercial and office real-estate within the Zone, and supporting trading and logistics infrastructure. Regarding gold trading, DMCC developed and continues to promote a number of initiatives to support the growth of the Dubai gold sector. These initiatives range from supporting the development of the gold refining sector through to supporting the growth of gold trading, and include the Dubai Gold & Commodities Exchange (DGCX), the Dubai Good Delivery Standard for gold refining, the establishment of the DMCC precious metals vault, and the creation of precious metal assaying standards. The Dubai Gold and Commodities Exchange (DGCX) is an electronic platform for financial and commodity derivatives established in November 2005 as a joint venture between Dubai Multi Commodities Centre (DMCC), Financial Technologies (India) Limited (FTIL), and the Multi Commodity Exchange of India Limited (MCX). DMCC originally held 50% of the DGCX shareholding, FTIL controlled 40%, and MCX held the remaining 10%, but DMCC moved to majority control of DGCX, with MCX and Financial Technologies still on-board as minority shareholders. In January 2016, FTIL sold its remaining shareholding in DGCX (27.3%) to DMCC, after Indian regulators deemed that FTIL should not hold stakes in financial exchanges due to its involvement in failed Indian commodity exchange NSEL. The DGCX and its offices are located at Level 37 of the AU Gold Tower, which is situated within the Jumeirah Lakes Towers (JLT) complex. DGCX is designated as a self-regulated organisation by the United Arab Emirates(UAE) Securities & Commodities Authority, and is an affiliate member of the International Organization of Securities Commissions (IOSCO). Note that there are 2 other securities exchanges in Dubai, namely NASDAQ Dubai, which focuses on equites and Islamic bonds, and the Dubai Mercantile Exchange (DME), which is an energy focused commodity exchange. NASDAQ Dubai was previously known as the Dubai International Financial Exchange (DIFX). These 2 other exchanges, which operate out of Dubai International Financial Centre (DIFC), are regulated by the Dubai Financial Services Authority (DFSA). The DGCX gold futures contract, is a physically deliverable futures contract, representing 32 ozs of 995 fine Dubai Good Delivery Gold, and traded in US dollars per ounce. The contract’s last trading day is the last business day of the month preceeding delivery. Delivery takes place on the 1st business day of the delivery month, via a Dubai Gold Receipt (DGR) in conjunction with a refiner’s certificate. The DGR is an electronic record of a vault receipt that was created by DMCC in 2005, and is based on the Dubai Commodity Receipt concept. DGR’s are initially issued by approved vaults within the DMCC system, and are tradable / transferable instruments. The futures contract’s cash settlement option is automatically invoked for all open positions that are not closed on the last trading day. The DGCX India Gold Quanto Futures contract, launched in June 2015, is denominated in US dollars, but the underlying is specified in Indian Rupee (INR). The Gold Quanto contract therefore provides 2 exposures, namely to Indian Rupee and to the Indian gold price. In general a ‘quanto’ is a derivative where the underlying is specified in one currency, but the derivative of that underlying is quoted in and settles in another currency at a fixed conversion rate. The DGCX Spot Gold contract (symbol DGSG) is a physically-settled US dollar denominated contract for 32 ozs (1 kg) of .995 fine gold. With 1 kilogram equal to 32.15 troy ounces, the deliverable quantity of 1 kilo of 995 gold equates to 31.985 fine troy ounces, hence the 32 ozs. The price quotation for the spot contract is USD per troy ounce. The contract was launched on 14 December 2015 and trades on the DGCX platform from Monday to Friday between 7am and 8pm Dubai time. This is the first on-exchange spot gold contract in the Dubai market, and is notable since most gold is still traded OTC in Dubai. Physical delivery within the contract is activated by an intent to delivery notice submitted to the DCCC by end of trading day. All open contracts not subject to delivery are marked to market and automatically rolled over to the next trading day. Physical delivery takes the form of a TradeFlow warrant via Tradeflow representing a 1 kg gold bar (31.99 ozs) with an accompanying refiner’s certificate at an approved vault location” in Dubai. This TradeFlow warrant is a similar but distinct instrument to the Dubai Gold Receipt (DGR) that is used for delivery in the DGCX Gold Futures contract. The DGCX Exchange by-laws contain contract specs for gold futures and gold quantro futures (page 54), delivery details for gold futures pages (55-56), and contract spec and delivery details for the DGSG (spot) contract (pages 115-117). The price quotation of the Spot contract therefore refers to the price of 1 troy ounce of gold delivered at an approved gold vault in Dubai, i.e. a ‘loco Dubai’ price. DGCX members, broker members of DGCX and customers of broker members are eligible to trade the spot contract. DCCC has initially approved bar brands from 7 refiners for the Spot Gold Contract. These refiners are The Perth Mint, Al Etihad Gold LLC, Emirates Gold DMCC, Istanbul Gold Refinery, and three Swiss refineries, namely Argor Heraeus, PAMP, and Valcambi. The approved vault providers for the DGCX Spot Gold Contract are Brinks Global Services and Transguard, and the three approved vault locations are the Dubai Airport Free Zone, Almas Tower in the DMCC in the JLT, and the Gold Souk in Deira. The DCCC announced that it would waive storage charges on all spot gold transactions until 31 March 2016. According to Bloomberg, in June 2015 the Shanghai Gold Exchange (SGE) was in discussions with the DGCX about the introduction of yuan-denominated gold products into Dubai. Earlier, in May 2014, the DGCX signed a Memorandum of Understanding (MoU) with the China Futures Association (CFA) to increase collaboration between the two bodies. The China Futures Association is a Beijing based national association of futures industry participants in China. DCGX offers a number of membership types. Broker members can trade DGCX contracts on behalf of clients or on a proprietary basis. Trader members can trade all DGCX contracts on a proprietary basis. There is also a special category of membership called clearing members which are authorised to clear trades (see below). To trade on DGCX, a participant can either be a DGCX member or alternatively can trade through a DGCX broker member. Trading participants on DCGX would include banks, commodity trading advisors (CTAs), brokers and proprietary trading companies. The latest DGCX trading platform is hosted using trading platform technology provied by Cinnober. Cinnober’s trading infrastructure for DGCX is called the EOS platform. DGCX also offers a free web-based GUI contract monitor tool called DGCX Marketwatch which can be used to keep track of DCGX contract prices during trading hours, including precious metals contract prices. The DGCX plans to operate a 1 year designated market-maker scheme in most of its futures products running from 1 April 2016 to 30 March 2017. This scheme, for which market makers can apply, includes the DGCX standard Gold Futures and India Gold Quanto futures products, and possibly the Spot Gold contract. Trade clearing on DGCX takes place through the Dubai Commodities Clearing Corporation (DCCC). The DCCC, a fully-owned subsidiary of the DGCX, is the central clearing counterparty (CCP) for all DGCX trades. Clearing members of DGCX are also members of an electronic platform called ‘TradeFlow DMCC’ which is a warehouse receipt system that utilises electronic warrants and acts as a central registry of ownership of commodities in Dubai. There are approximately 85 clearer members of DCCC, with representation from UAE companies as well as from companies headquartered in markets such as the UK, Singapore, (example United Overseas Bank Bullion and Futures (UOBBF) and Switzerland. All DCGX trades clear through these clearing members. One of DMCC’s gold market initiatives has been the creation of the Dubai Good Delivery (DGD) Standard for accreditation of gold refiners that produce brands of 1 kilogram gold bars (995 fineness) for the DGCX. The accreditation is of the refiners for their compliance with best practice in the gold refining industry, but the DGD Standard is specifically for the refiners’ production of kilobars. There are currently 13 DGD members including PAMP, Argor-Heraeus, Perth Mint, Rand Refinery, The Perth Mint, Heraeus, Emirates Gold, Istanbul Gold Refinery, and Krastsvetmet of Russia. There are also 14 former members of the DGD Standard including Royal Canadian Mint, Metalor, Johnson Matthey, and Dubai gold refiner Kaloti Precious Metals.The DGCX also lists the DGD members brands on its own website and refers to them as ‘Approved Brands – Gold’. The DMCC removed Kaloti from the DGD list in April 2015 saying that Kaloti had not “met DMCC’s practical guidance for market participants in the gold and precious metals industry”. Emirates Gold, located in the DMCC, is a member of the Dubai Good Delivery list for gold. Emirates’ refinery processes up to 200 tonnes of gold per year. The refiner’s gold bars have also been accredited for India’s Multi-Commodities Exchange (MCX). Emirates produces a range of gold bars including the popular investment grade kilobar. 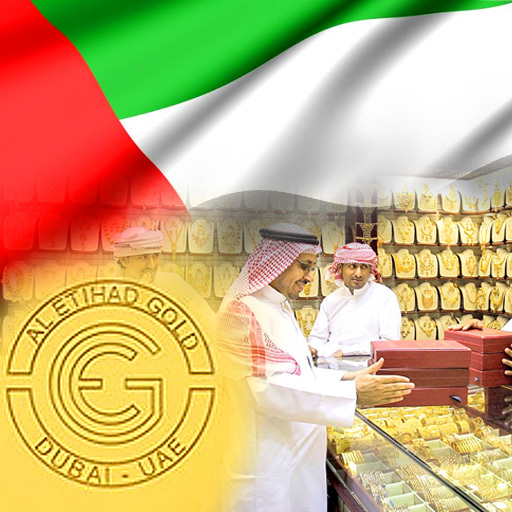 Al Etihad Gold is a member of the Dubai Good Delivery list for gold, located in the DMCC. The refinery produces a range of gold bars from 400 ozs down to 100g, and minted gold bars from 100g down to 1g. Kaloti is a former member of Dubai Good Delivery list for gold. In April 2015, the DMCC removed Kaloti from the Dubai Good Delivery list. Kaloti’s precious metals refinery operations are the largest in the UAE, and are based in the Emirate of Sharja (adjacent to Dubai to the north-east), and also in a new refinery in Dubai which has an annual production capacity of 1,400 tonnes of gold and 600 tonnes of silver. Kaloti produces a range of cast gold bars from 400 oz bars, through to kilobars and 10 tola bars, down to 100g bars. Kaloti is also a member of the Istanbul Gold Exchange and Shanghai Gold Exchange International. Dijllah Gold operates a refinery in the Saif Zone in the Emirate of Sharjah, near Sharjah Airport. This refinery has an output capacity of 400 kilobars per day. Dijllah’s gold bar product range includes kilobars and ten tola bars. Dijallah Gold has its headquarters in the Deira areas of Dubai, and a gold trading office in the Almas Tower in Dubai. The Gigi Group and Al Ghurair run a joint-venture gold refinery called Al Ghurair Giga Gold, located in the DMCC. This refinery has an annual production capcity of 100 tonnes of gold. Although it doesn’t have a refining operation in the Emirate, Turkish gold refinery Nadir operates a marketing and distribution office in Dubai, overseeing Nadir’s international activities. Nadir’s office located in the Jumeirah Lakes Towers (JLT) complex. Likewise, Istanbul Gold Refinery’s international subsidiary, IGR Global, runs a marketing and business development office in the DMCC in Dubai, located in the Almas Tower. Brinks, Transguard and G4S are the DGCX’s three approved vault providers in Dubai. Brinks Global Services operates precious metals vaults in both the Dubai Airport Free Zone and at Almas Tower in the Jumeirah Lakes Towers complex. Transguard, which is a division of the airline Emirates, operates a precious metals vault in the DAFZ and has branches at the Almas Tower and the Gold Souk in Deira. Transguard handles all valuable cargo going in or out of Dubai International Airport, and is specifically authorised to do so by royal decree. Rashidiya is near the Gold Souk (Souq) in the Deira area, south of Dubai International Airport. MAF Securicor was a joint venture between Securicor and MAF Investments (a company controlled by Majid Al-Futtaim). In 2006, Securicor rebranded as G4S. In April 2009, the DMCC opened its own precious metals vault in the 5th (lowest) basement of the DMCC Almas Tower at Jumeirah Lakes Towers, and one story below sea level. When the DGCX Spot Gold Contract was launched in December 2015, the DCCC specified Brinks Global Services and Transguard as the approved vault operators for the contract, with the same approved vault locations as above, being the DAFZ, the Almas Tower in the DMCC in the JLT, and the Gold Souk in Deira. The DMCC has published some gold import and export data but its most recent data runs from 2003 to 2011. Nevertheless, this data, sourced from the Dubai Customs Statistics Department, highlights the large volumes of gold flowing into and out of Dubai, and the consistent growth in the gold trade since 2003. In 2011, 745 of tonnes of gold were imported into Dubai and 451 tonnes were exported (two way flow 1,196 tonnes in total). The corresponding figures for 2012 were 707 tonnes of gold imported and 418 tonnes exported (two way flow 1,125 tonnes in total). In contrast, during 2003, 385 tonnes of gold were imported into the Emirate, and 122 tonnes were exported (507 tonnes in total). Dubai’s largest gold trade export destinations are India, Turkey and other Middle East countries such as Saudi Arabia and Egypt. The Dubai Gold and Jewellery Group (DGJG), based in Deira, is a trade body representing the interests of 600 members involved in gold bullion and jewellery production activities and in the gold jewellery wholesale and retail sector. Many of Dubai’s gold outlets are located in the Gold Souk in Deira, one of the largest single gold retail centres in the world. DGJG liaises with government bodies, facilitates member attendance at international exhibitions, and organises the annual ‘Dubai City of Gold’ conference[fn Dubai Gold and Jewellery Group (DGJG) incorporating Dubai City of Gold http://dubaicityofgold.com/about-us/]. The DGJG is supported by the Dubai Department of Economic Development (DED) . The DGJG also publishes a daily Dubai “Retail Gold Rate” which consists of gold prices for 24 carat, 22 carat, 21 carat, 18 carat gold as well as a price for the Ten Tola (TT) bar. These prices are updated 4 times per day and once on a Saturday, and are used by gold retailers in Dubai and the UAE as a gauge with which to price their gold bar and jewellery sales. Some of the very large Middle Eastern gold jewellery retail groups that are headquartered in Dubai include Damas, and Taiba. A ‘Dubai Precious Metals Conference’ (DPMC), backed by the DMCC, has taken place each April since 2012. The agenda for the latest DPMC can be seen on the Conference website. The World Gold Council launched the Shariah Gold Standard at DPMC, in April 2016. Swiss precious metals group MKS has a presence in Dubai through its MKS Precious Metals DMCC office. MKS’ refinery PAMP also maintains a wholseale and distribution office in Dubai, which is located in the Gold Souk in Deira. The Giga Group, which jointly runs the Al Ghurair Giga gold refinery, imports bullion into Dubai from Swiss and German suppliers, and distributes to the local market. INTL FC Stone,, the international commodities trading company, offers precious metals services to wholesalers in Dubai, and is also a trading member of the DGCX. Banks active in the gold sector in Dubai include ICBC Standard Bank, Emirates NBD, and Standard Chartered. ICBC Standard Bank also offers financing, hedging and lending services, and has a physical storage and distribution capability out of Dubai. Standard Chartered has a substantial presence in Dubai, and offers risk management, hedging and financing services to customers for gold and other precious metals. Emirates NBD, which was the result of a 2007 merger between Emirates Bank International and the National Bank of Dubai (NBD), is Dubai’s biggest banking group, and is active in the gold market through its wholesale and private banking divisions. HSBC, Standard Chartered and Emirates NBD are also clearing banks for the DGCX. The Dubai Emirate issues gold coins designed by the DMCC and manufactured by Swiss gold refiner Argor-Heraeus. Editions include gold coins with the Burj Khalifa and Palm Jumeirah designs. Over the last 15 years, Dubai has emerged as a significant player in world gold trade and in the gold refining sector. This is no mean feat given Dubai’s previous position as a small middle-eastern gold market, and it highlights the impact of pro-gold government policy support from the UAE authorities.Dubai now acts as a regional gold distribution hub and also links into surrounding gold hubs such as Istanbul and the Indian market. Despite some setbacks and lingering image problems about Dubai’s laxness in complying with international standards of gold sourcing, the continued growth of exchange-based gold trading on the DGCX, and the Emirate’s and wider Gulf’s love of gold will ensure that Dubai and the UAE remain firmly at the heart of the world gold trade.